I’m sharing this article, which first ran in Communicate Middle East a couple of days back. I care deeply about the industry and about MEPRA, to which I gave five years of board service. My message is simple – we can and must do better when it comes to corporate governance. And MEPRA must lead by example. “It’s no secret that I care about the communications industry in the region. I’ve done more than my fair share when it comes to supporting people and organizations in becoming more aware of what good communications is all about, and why it’s central to building strong reputations. I’ve also spent years advocating for the adoption of best practices, including good corporate governance, through both my day job and my board positions for several communications associations including the Middle East Public Relations Association (MEPRA), Global Alliance for Public Relations and Communication Management, International Association of Business Communicators (IABC) and Advertisers Business Group (ABG). Good corporate governance builds reputation; weak corporate governance undermines trust. I’m not simply talking about following regulations and laws, but also the need to be transparent as well as feel that an organization’s leadership is doing the right thing, listening to concerns and acting with integrity. As a member of the communications industry who is interested in how my profession is perceived, I care about reputations and the need to do the right thing. One of the organizations I’ve supported, both as a member and through a board position, is the MEPRA. As a member, I’ve always maintained that we must adhere to the strongest standards of corporate governance. It’s integral to our mission of empowering communicators in becoming strategic advisors, particularly to organizational leadership. The Boards shall be elected from MEPRA’s members. The election will take place at the Annual General Meeting to be held each year or at an Extraordinary General Meeting if required and agreed by a majority of the Executive Board. The Executive Board shall be responsible for establishing the nomination and election process each year, provided always that: nominations for each office of the Boards will be invited from the members of the association when giving notice of the Annual General Meeting. The Executive Board must receive all nominations in writing in reasonable time before the date of the Annual General Meeting. Every nomination shall be supported by at least two voting members of the Association. The Executive Board will circulate the list of nominations to members not less than two weeks prior to the Annual General Meeting. Election will be by a simple majority of the members eligible to vote. All MEPRA members are eligible to vote in the election of the Strategy Board. Only members of the Strategy Board are eligible to vote in the election of the Executive Board. Only members of the Executive Board are eligible to vote in the election of Chair and Vice Chair. No member may vote for him or herself. If for any reason a member of the Boards is unable to serve for a full two years the vacancy will be advised to the members and the Executive Board may fill the vacancy from any candidates that express an interest in filling the vacancy and which have the competencies required in order to fill the relevant role. The decision of the Executive Board in relation to filling vacancies shall be final. This article won’t win me many plaudits, and I expect that I’ll be criticized for openly airing this. However, we must be able to have the courage to speak honestly, even to those in power. Speaking truth to power means that we believe deeply in what we say, that we care, and that we understand the risks of not doing so. Doing what’s right, rather than what is politically convenient, is incumbent on all of us. It would be easier for me – or any of us – not to say anything. I was asked by a board member, “Why do you care?” I care because I am part of this region and this industry. Reputations matter, especially for a body that represents what we do. I believe in the region’s talent, and our ability to break down misperceptions about the Middle East when it comes to corporate governance. I also realize that if we are not transparent, if we don’t engage proactively, and if we don’t follow our own rules, we will not have the trust that we need to raise the profession from one that simply executes to one that advises and guides a company and its board to do the right thing. If you don’t believe me, that’s fine. I may be taking all of this too seriously. However, go and ask any Abraaj shareholder about the implications of weak corporate governance. If you still don’t understand the need to build strong corporate governance and its role in reputation building, then maybe communications isn’t the right role for you. If there’s ever a word to kill a conversation, it’s ethics. Despite our job being all about reputations, we’ve not given ethics the importance and time that it deserves. This is changing, thanks in part to the efforts of a number of associations, including the Global Alliance, the Public Relations Society of America (PRSA), the Public Relations Institute of New Zealand (PRINZ), the International Communications Consultancy Organisation (ICCO), and the International Association of Business Communicators (IABC), there’s a renewed focus on putting ethics at the heart of what we do and why we do it. But why does ethics matter, really? Let me first state the obvious; communications has undergone a drastic change over the past decade, owing to the rise of digital channels and social media platforms. Today, it’s easier than ever to reach a global audience through the likes of Facebook or Google. And it’s also easier than ever to manipulate these platforms, to share messages that are false through personas which are fake. I’m not talking theory here. We all saw the work that was undertaken by Bell Pottinger in South Africa, which led to its collapse. I live in a region which is being consumed by online trolls, botnets and other unethical activity, much of which is reported to be undertaken not by individuals but by organizations. It is in this context that we need to renew our commitment to undertaking the best ethical practice, which will apply to every single one of us, no matter where we work and how long we’ve spent in the industry. The sixteen principles which were announced this week by the Global Alliance are a guide that we should all use in terms of how we ourselves practice and represent our profession. We have a responsibility to society, to our stakeholders and to fellow professionals to uphold these principles in everything that we say and we do. Looking back, what I’m most proud of when I read over the ethics announcement made by the Global Alliance today is that the taskforce that has worked on this represents the majority of associations and communicators worldwide. There’s a growing realization that we need to step up and not just demonstrate that we are against unethical practices as one, but that we’re adopting best practices. We want to be an industry that promotes positive messages, rather than a profession which is known by monikers such as ‘spin doctors’. Jean and the other task force members have put significant thought and energy into this project, and this is only the beginning. You’ll find resources such as case studies, podcasts, newsletters and advisories that will bring ethics to life through storytelling. This archive will grow, thanks to you and your submissions from around the world. We have to ensure that ethics remains at the core of our industry, and that we feel able to stand up when we see or are asked to do something which is unethical. I’d like to thank Jean, Jose Manuel and everyone who has given time to bring this project to life. We all owe them a debt of gratitude for their efforts to promote a stronger, more ethical communications and public relations industry. My last request is to all of you. Please use these resources, learn from them and let them guide you when it comes to ethical communications. Let’s be known as an industry that is one of, if not the most, ethical in terms of what we say and what we do. This post first appeared on the Global Alliance website. A recent LinkedIn comment on an event happening in a couple of months time has led me to write this post, which I initially featured on LinkedIn and which I’m now posting here so people can find it more easily (LinkedIn, your SEO is lousy). The person asked, rightly, why the event only had two women speakers out of a total of nineteen. She could have also asked why there were no Gulf women on the speaker list. In an effort to help event organizers find these speakers and promote diversity on stage. I’m also tired of manels and mansplaining! All the women below are exceptional in their own right, and these are all people I’ve worked with or heard speak. If you’re organising a marketing, media, communications or public relations conference in 2018 or beyond, you need to include these women in your event. For added measure, I’m including a number of women who are based outside of the Gulf. If there’s any additional suggestions, then please do share them and I’ll add to the list. And apologies for leaving anyone out. Jehan Abdulkarim – A Bahraini national, Jehan has worked in the private sector for over 15 years, at blue chips such as Cisco, Oracle and Accenture. She’s also worked as a journalist. She’s the most senior Gulf woman I know working in non-government, and she regularly talks on issues relating to marketing and comms in emerging markets. Maha Abouelenein – Egyptian-American Maha has worked for a host of tech firms such as Google and Orascom, as well as agencies such as Weber Shandwick. She’s based between Cairo and Dubai, and often talks about marcomms in the tech sector, as well as issues relating to government and public affairs. Saba AlBusaidy – Oman’s Saba Al Busaidi is one of the most prominent advocates of digital and social media in the Gulf. She frequently talks about digital marketing in both languages, in Arabic and English. Saba was the first Omani women to to be certified as a Social Media Strategist. She has also played a big role in supporting local talent and small-to-medium enterprises. Dr Hessa AlJaber – One of the highest profile government figures in the Gulf, Qatar’s Dr Hessa AlJaber has led her country’s ICT strategy for over a decade. Dr Hessa has keynoted many an event, with a particular focus on the impact of technology, and the need to promote STEM education among the region’s youth. 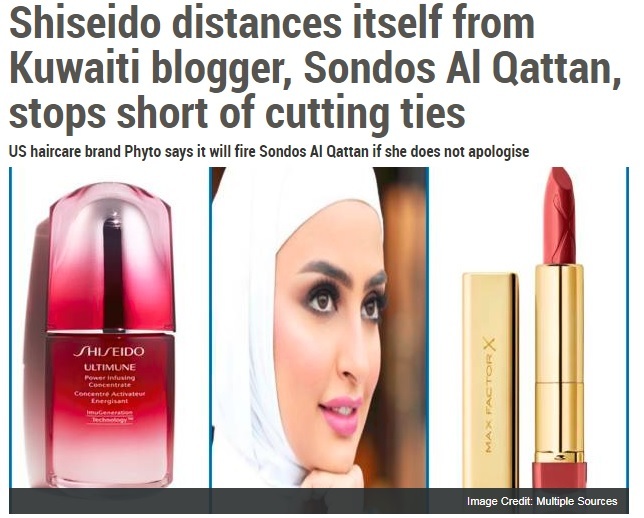 Hind Al-Nahedh – A pioneer in the social media space, not only in Kuwait but in the wider Gulf, Hind Al-Nahedh’s experience spans Corporate Communications, social media, integrated marketing, collaboration and blogging. Hind is often sought out to talk about social media and content/influencer marketing in the Gulf. Princess Reema Bint Bandar Al-Saud – Princess Reema’s work across philanthropy, social purpose and business has consistently challenged gender conventions in conservative Saudi Arabia. In 2010, the marketing and PR worlds took notice when Princess Reema’s ‘Woman’s Stand’ campaign won Best in Show at the EMEA SABRE Awards. Her work in CSR and in marketing means she’s often approached to talk at events and conferences. Fida Chaaban – Lebanese Canadian Fida straddles both the media and communications worlds. Prior to her current role, she was the editor-in-chief of Entrepreneur Middle East magazine. Today, she serves as the chief communications officer of KBW Investments. With an eye for both, Fida talks about how the two can learn from and improve one another. Elda Choucair – As the CEO MENA at agency PHD, Lebanese national Elda is probably the most senior woman working on the agency side today in the Gulf region. Elda’s specializes in media planning and strategy. She’s also often asked to talk about how the industry can better promote/support women who want to work in the advertising & creative industries. Ganga Dhanesh – As Assistant Dean for research and graduate studies at Zayed University’s College of Communication & Media Sciences, Singaporean Ganga is playing a key role in developing the next generation of Emirati female communicators. Ganga’s research areas are strategic communication management, corporate social responsibility and internal relations. Mariam Farag – Marian leads CSR for MBC, the largest broadcaster in the Middle East region. She’s also worked with the United Nations. Mariam often talks about a number of her passions, including corporate social impact, storytelling, humanizing the brand and youth development. Maria Gedeon – A destination marketing executive with over 14 years of experience, Maria heads up marketing for Majid Al Futtaim Cinemas. She’s also a board member for the Marketing Society and talks about the challenges and opportunities facing the industry. Noha Hefny – An Egyptian national with 16 years of experience in comms roles with the United Nations, PepsiCo and McKinsey & Company, Noha talks about issues such as mentorship, social entrepreneurship, brand and corporate reputation. Louise Karim – Living in Dubai since 2009, UK national Louise has led marketing teams at leading regional and international companies including DABO & Co, The Dubai World Trade Centre and Emirates Airlines. Today she manages mums@work, a female-focused recruitment agency. Louise often talks about the issues women face in the industry. Eleni Kitra – As a global sales lead for Facebook across the Middle East and Pakistan, Eleni is an expert in contemporary digital marketing trends. A Greek national, Eleni has also worked as the MD for OMD Greece. She’s also passionate about mentoring. Zaira Lakhpatwala – Zaira is the best-known female journalist in the Gulf reporting on the marcomms industry. Zaira heads up Communicate magazine, part of the Mediaquest Group, and she often moderates panels on the marketing and communications industry, on a host of subjects. If you’re looking for an expert/journalist, Zaira is your woman. Summer Nasief – A Saudi national with a distinguished career in the private sector, Summer has led technology teams for the likes of IBM, Honeywell and Microsoft. Summer talks about innovation and how technology is changing a host of industries, including marketing and communications. Maysoun Ramadan – Hailing from Jordan and Turkey, Maysoun is the head of Communication and Public Affairs for Roche Diagnostics Middle East. Maysoun’s passion includes talking on the issues of gender parity and female representation. Maysoun is also an EMENA board member for the International Association of Business Communicators. Fiona Robertson – Fiona is a Senior Associate in the Technology, Media and Telecommunications practice in Dubai’s Al Tamimi & Co. law firm. In plain English, that means she knows the region’s media laws better than anyone else, and is able to knock the eyeballs of any audience out of their sockets with her understanding of legal issues. Kindah Sais – A Saudi national with Lebanese roots, Kindah is the Global Diversity & Inclusion (D&I) Leader, for the Middle East and Africa at Boeing International. Her career includes roles at Procter & Gamble, and Ogilvy. Kindah talks about the importance of creating diverse and inclusive work places and teams for firms based in the region. Heba Sayed – As an IBMer who works across both marketing and technology, Egyptian national Heba is often asked to talk about how technology can be better leveraged by both marketeers and communicators in the areas of customer engagement, augmented intelligence (IBM’s definition for artificial intelligence) and digital solutions. Valerie Tan – As the VP for communications at Emirates, Valerie is one of the best speakers out there on contemporary communications practices. A Singapore national, Valerie is able to give a unique perspective on communications across the Middle East and Asian Pacific region. It’s rare for brands to deal with a reputational crisis so openly in the Middle East. Last week, we had two issues happening at once. First up was Dubai’s JW Marriott Hotel, which took the decision to part ways with celebrity chef Atul Kochhar after he wrote a tweet that offended many Muslims (the offending tweet is below, and you can read the back story here at the Khaleej Times). The hotel terminated Kocchar’s deal with its well regarded Rang Mahal restaurant. “Following the recent comments made by Chef Atul Kochhar, we have taken the decision to end our agreement with him for Rang Mahal. With the termination of our agreement, Chef Atul will no longer be associated with the restaurant,” Bill Keffer, general manager of the hotel, told Gulf News. Atul’s tweet was highly criticized, both by individuals as well as the Marriott itself. The second reputational issue was faced by Nike. Days before the beginning of the World Cup, Nike announced that it would not be providing equipment (think boots) to the Iranian football team. Unsurprisingly, the decision hasn’t gone down well with fans of the Iranian football team, as well as the team’s coach, Carlos Queiroz, who criticized the timing of the announcement. There are two basic lessons that we can take from the situations Nike and Marriott found themselves in. 1. Do/Continue your Due Diligence – While the Marriott moved quickly to tackle the crisis, the question must be asked of the due diligence undertaken on Atul Kochhar’s views. Every time an agreement is undertaken, the in-house team/agency must check the influencer’s/celebrity’s background, including their social media. And they must ensure that they’re on top of anything which may be perceived as being controversial. Many have pointed to Atul Kochhar’s social media posts prior to last week’s outburst, posts which could be seen as being Islamophobic (the below is just one example of this). While hindsight is a wonderful thing, the Marriott team could have developed an insight into Atul Kochhar’s views through monitoring his social media posts before he wrote something that would have caused the brand reputational damage. This month’s crisis may have been averted. 2. Foresee issues and tackle them proactively – Our role as communicators is to understand what is happening in the outside world, and bring those insights to senior management. We have to be social and political analysts, and we have to be able to monitor issues and foresee the outcomes that will impact our organizations, and work proactively to ensure that an issue doesn’t become a crisis. How Nike’s communications team didn’t foresee what could have happened re Iran and US sanctions is beyond me, as is the possibility for Nike to apply for a permission to be able to supply the team with equipment (boots). It was a major miss, and handed rival Adidas an open goal. Do you have any additional insights from these two issues? What are your thoughts? As always, I’m happy to hear them. Till then, take care! I’ve just finished judging hundreds of entries for the Cannes Lions. The experience has been overwhelming, not just due to the amount of work submitted but also due to the work’s quality. I’ve judged for years, and there are few competitions that come close to the overall level of excellence (I’d say the Effies, the IABC Gold Quills, and the Holmes Report’s Sabres). Throughout all of my judging experiences, there’s a couple of simple lessons that communication professionals need to bear in mind. These four steps will help create powerful campaigns that should be worthy of putting into any top-tier awards competition. 1. The Why – Is What you Want to Say Powerful Enough? First of all, why do you want to communicate. Are you launching a new product, or do you want to improve your company’s reputation. The clearer you are on why you want to engage, the simpler it will be to come up with a narrative that your audience will understand. There’s got to be a strong purpose to your communications, which then links into the second step. You know why you want to communicate, but how does your narrative tie into the interests of your audience? Far too often communicators don’t take the time to listen and observe their publics, and simply go out, all guns blazing, with messages that don’t resonate. Powerful insights connect your audience with your narrative in a way that engages them and makes them want to listen to you. If you don’t do this well, your campaign won’t cut through the thousands of messages that we process on a daily basis, and you’ll have made no impact whatsoever. Take your time, do your research, and get out of the office (and off the Powerpoint presentations) to understand what your audience cares about and how you can tap into those emotions. In other words, bring the outside in. Bold communicators are also ready to tie in their narrative with social issues. This isn’t always easy, and can alienate certain groups if your target audience is the public. However, as business becomes more politicized, I expect communicators (and organizational leaders) to realize that companies can’t shy away from taking a stand on issues that matter both to them and their stakeholders. Now we get to the fun part, which can make or break a campaign. No matter how good your planning and research is, all your audience will see is the execution of your strategy. Effectively, what do you want your communications to achieve and how are you bringing it to life? There’s a couple of themes I’ve noticed of late. Either campaigns go as big as possible during their execution, and include as many people from the target audience during the execution itself (this is different from sharing the campaign’s content). Or, they execute an execution with a handful of people, and use that content to tell a person narrative. Both can work very well if tied in well enough with the brand/product narrative and with the audience insight. What’s also not surprising is how the best campaigns are using both online and offline mediums to amplify the narrative. Print, radio and television plays a role in engaging an audience, whilst digital keeps the engagement alive and allows for dialogue. Some of the most recent campaigns I’ve seen also use dark social; one smart team were creating content solely to be shared on WhatsApp. I expect this trend to gather pace as communicators realize the power of one-to-one or one-to-a-few messaging platforms. Another noticeable trend is the use of paid media to boost the reach of content. The social media platforms have become masterful at ensuring we have to spend money to reach our audience, no matter how good the content. Influencers help to mitigate the anti-viral nature of social media platforms. Either way, it’s going to cost more to reach your target audience today online than it would have done a couple of years ago. At the very least, creating content has never been easier (or cheaper). Finally, how do you prove your success? The most common measurement was AVEs or advertising value equivalency. Communicators are dropping this measure, but at a rate which is slower than I’d like. Most of the work I’ve judged this year uses AVEs. Another common measure is impressions, basically the number of people exposed to the message. Smart communicators are shifting to more meaningful indicators. A simple one which does crop up more frequently is sentiment, either in traditional media or online. Communicators are also borrowing from their marketing colleagues, and are using some digital metrics (engagement, CTRs etc), as well as brand measurements focusing on reach and response. Brand measurement helps us understand if the campaign has won viewers’ selective attention and leave a brand-associated impression and if the campaign has triggered a change in behavior or attitudes favorable to the brand. The ultimate measures are those which are tangible. Has the campaign helped sales, has it raised more money? Has the campaign resulted in a behavioral shift, has it resulted in new regulations? Some communicators are capturing and sharing this, but it’s still only a small percentage (I’d say single digits). This needs to change, especially if communications is to be seen as a strategic function within organizations. Here’s my four pointers to what makes for an award-winning campaign. As always, I look forward to hearing your inputs. Please do share your thoughts with me. And best wishes for all those who have entered this year’s Cannes Lions! There’s some outstanding work.